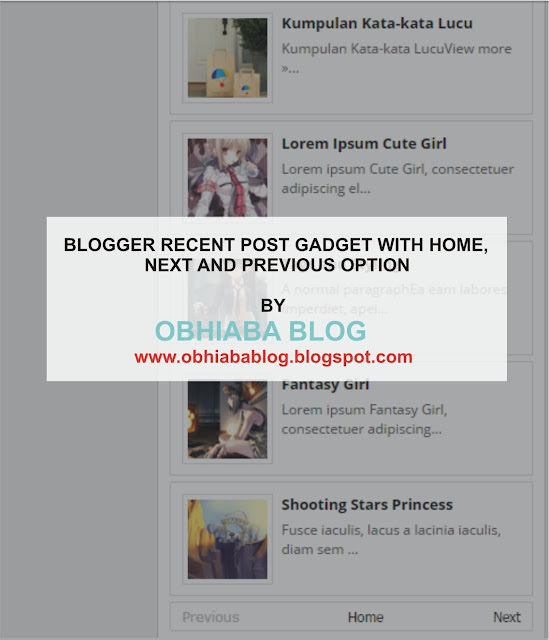 Today I will be sharing with you how to add blogger recent post widget with home, next and previous option. And adding this widget is just an easy one step method and your blogger blog will be looking elegant. I decided to share this great tool with you so as to enable you to expose a wide range of your blogger contents to your readers without filling up your blog with a lot of widgets. And also the widget performs well in terms of traffic and SEO, as it enables your readers to read a wide range of post they see on the sidebar. The beauty of adding this widget is that it is extremely easy and straight forward. I mean it is beautiful. The plugin shows the following features. Normally recent post widget offers only the above-listed options. But this new blogger recent post widget features more advanced features. Previous page button which takes you back to the already open post. Now with the above features, you definitely need to include this widget on your blog. Change Obhiabablog.blogspot.com to your homepage URL. You can also customize the number of posts to be shown perpage by simply change the “ var numfeed = 5;” to any preferred number. The last thing to change is the number of characters to be shown as the title and summary. Here you can change the value “ var charac = 40;”. Blogger is a home of customizations, and if you have any idea of what you doing, then you can create amazing widgets for yourself.